Are you trying your hand at Retail Arbitrage but don’t know what to look for in a product? Whether you are a new or veteran Retail Arbitrager, there are 6 basic criteria you need to evaluate when buying the right products. So you’ve picked up your first product and scanned it into your Amazon Seller App and you’re analyzing the data. Although there are 5 factors on this list, Profit is no doubt the most important one. After all, we are in this business to make money. Finally, you will want to add in the cost of your item, which is the buy price plus any sales tax you may incur. Now, you have a solid look at what your bottom line is. TIP: We generally look for products with profits exceeding $10. However, if it is a smaller product with lots of units available, we could make an exception. Now that you’ve found good profit potential in a product, you will want to assess the Amazon Best Sellers Rank. The Best Sellers Rank gives you an indication of how well a particular item is selling on Amazon, at a given point in time. And sometimes you will notice that there are multiple ranks for a product, one for the main category and a rank for each sub category, if applicable. As you can see in the image below, this Dewalt Power Tool ranks 64 in the main category of Home Improvement and is the #1 Best Seller in the Drill Drivers sub category. You don’t have to be a rocket scientist to figure out that this product sells like hot cakes. TIP: While rank can vary greatly from category to category, to keep things simple we suggest buying products under a 50,000 rank in the main category. This is especially important when starting out. One thing that we all know about, whether we are familiar with Amazon or not, is that reviews carry a lot of clout. Meaning, the more reviews you see the more popular an item is. The thing to consider is that a very small portion of customers leave reviews. So, if you see hundreds of reviews on a listing it would very likely indicate that the product is in popular demand. When looking at Amazon reviews, there isn’t a magic number so to speak. In fact, we’ve sold plenty of items without any reviews. Nevertheless, you should check and see the dates of the most recent reviews. If you find a product and the last review was in 2009, well you might need to seriously reconsider the other factors again.On the other hand, if there are 5 reviews in the past week you know this product is a winner. Don’t forget, quality reviews matter too. I’m not saying go and read reviews, but if a product has an overall 1 star review….Well, you get the point. Reviews are certainly a factor to be considered. TIP: Sometimes Amazon doesn’t provide any rank, even for hot sellers. So checking out the amount and dates of reviews is a solid way to check if it’s by accident or if the product is indeed a dog. When analyzing a product, you want to understand how much competition is out there. And two of the three competitors are FBA & FBM. If you don’t know what I’m talking about, you need to get briefed with my article about FBA vs FBM. When looking at a product’s information, it is vital to consider if the product is available FBA and how many total sellers there are. Because if there aren’t any FBA sellers and you sell via FBA, you can command higher prices and will most likely have higher sales volume. So if the numbers were borderline in the first two factors, knowing that there are few or no FBA sellers makes those numbers look WAY better. On the other hand, if there are a plethora of FBA sellers, don’t get discouraged. Just know that the listing is much more competitive and prices can be aggressively targeted by sellers willing to compromise higher margins for quicker sales. 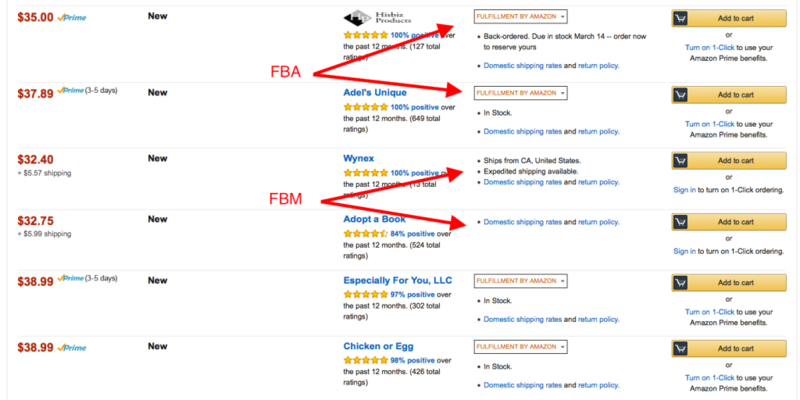 Below you will see how to distinguish between FBA and FBM sellers. In terms of competition, think of Amazon.com as an FBA seller times a gazillion. After all, it is their business so more often than not Amazon buyers will buy direct from Amazon versus third party sellers. So, it is crucial to understand that if Amazon.com is selling a particular product they will typically command a majority of the sales. One of the reasons for that, is because they command the Buy Box. Since they have such perfect Seller Statistics they don’t even need the lowest price to win the Buy Box. And if you try undercutting their price to get the Buy Box, chances are that Amazon will pretty quickly closely match your price to get the Buy Box back. However, we’ve noticed that if your price isn’t significantly lower, Amazon will keep their price as is and you will get sales from those savvy buyers who will always find the lowest price, whether it’s in the Buy Box or not. Now, I’m not BY ANY MEANS trying to discourage you from listing against Amazon.com. I’m just letting you know that when you see Amazon.com it could impact your profit/sales volume a bit. Trust me, we’ve sold tons of products that we listed against Amazon. Sometimes we had to lower our price a bit, and other times Amazon ran out of stock and we soaked up the sales in the interim. TIP: When you scan a product in the Amazon Seller’s app, the Amazon.com listing won’t come up as the lowest price, even if it is. Instead they pull the lowest price of FBA or FBM. So be sure to keep your eyes peeled for Amazon.com listings. In the end, you will have to make the final decision whether or not you will move forward with a product. That’s why it is always recommended that you start off buying products in a category that you have some familiarity with. Due to my background in Home Improvement, I started buying products in that category. Once I became more familiar with the other selling factors and how Amazon works, I moved onto other categories. Because no matter what factors I overlooked, I could still analyze a product and figure out if there was money to made. Be cognizant of these 6 factors when you’re considering Retail Arbitrage products, and watch your revenue soar!